Cave Story is a brilliant game, and it will still be a brilliant game when it arrives as a retail title on Nintendo Switch as Cave Story+. It was arguably a trendsetter, and will go down in the annals as one of the best 'early' Indie games. It must be really good because we sure are tempted to buy it again, which is something we've said a few times over the years. At $30USD it'll offer HD visuals, multiple modes and some new weapons / content. Now it's been confirmed it'll also support local co-op on Switch, with more details promised along with a neat GIF. I have been meaning to check this out... I wonder how the co-op will work? If it works well, this is even more interesting to me. This seals the deal for me, I'd love to introduce the game to some people through co-op. Well, that pushed me off the fence. Pre-ordered. I can't imagine the game being particularly well suited for co-op but I suppose it's a neat addition nonetheless. 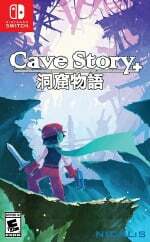 Nevertheless, I already got this pre-ordered, I love Cave Story. I've actually never played this game, despite it being readily available for free on PC... I think this will push me to finally get it. Local co-op is great. This will probably push me into finally trying the free PC version to help me decide if I want it on Switch. Tell me why. Cuz I started the game but never finished, LOVE the soundtrack and want to really play it someday. HD visuals might actually be worse for something that was made to be "bit" graphics and chiptune music through right? Yeh, actually, looking at the Switch price, maybe I'll get it on 3DS instead. As others have commented, the $30 pricing seems a bit, um, rich. Co-op is cute but, as Speedracer comments, an HD update for pixel art seems redundant. Nevertheless, I'm a sucker for Metroidvanias. If this happened to fall into the same UK/EU price band as Wonderboy: The Dragon's Trap, I would definitely bite. Not played it on any other formats, but I've heard the praise. I'd really like to see more games priced like Blaster Master Zero, though! $30 for the Switch version when it's free on PC? Bye! Physical release AND local multiplayer? Even more of a reason to pick this game up! Especially because I haven't played it before! I said previously that I'll be skipping this one since I own it on PC, Wii and 3DS already but if they add more extra features like co-op, I might buy it again. It's just that good. Got it on 3DS (physical), love the 3D implementation, will thus probably not need any other version that doesn't have that. I'll buy it at high price! Make it wifi while at it. Having own screens for each player would be Switches killer feature. Cave Story co-op??? Welp, GG. I wasn't going to buy it but that small addition totally changed my mind. DO WANT!!! I kind of want it, may get it, but I still have the launch release of the 3DS one in that 3d sleeve on my shelf. I have the 3DS version, so I was thinking I didn't need this version, but… Co-Op? I'll pick it up when I find it on offer. @Varoennauraa OMG! Yes! I didn't even think of that! I still need a Switch, but that'll give me time to hear what other people think of co-op instead of blindly splashing $30 on a game I have on DSi, 3DS (via eShop), and PC. Day one, physical. Love this game. Yup. Local coop seals the deal. And, just $23.99 with BestBuy GCU, for a physical version... done done and done. PC is nice, but it's not portable and it's not co-op with anyone, anywhere you go. I have PC and I won't even waste my time with this game on PC. The 3DS version (not the 3D one) is quite enough for me. @speedracer216 PC version is the bare minimum of the game. A friendly reminder that while Cave Story is free on PC, the upgraded Cave Story+ is not. Given the new features the Switch version has over Cave Story+, you can think of it as Cave Story++. While $30 is steep, it's justified. Nicalis is mining that well. Heck if pros keep buying it why not? Adding co-op is really intriguing. I've bought Cave Story about as many times as I've bought Super Mario Bros. Physical copy and new features? Damn I'm eager to run through this game again! @SLIGEACH_EIRE Cave Story+ is like fifteen dollars on Steam???????????????? Have the WiiWare version which I haven't played yet, guess I'll have to give it a try.